The cottage has 3 double bedrooms (and importantly) 2 bathrooms. Honeysuckle Cottage is 250 years old and is a traditional Cornish Cottage which has been sympathetically extended and modernised whilst retaining many character features. It has been furnished to a high standard with the comfort of holidaymakers in mind. It is detached and stands in a quiet wild flower banked lane used, in the main by dog walkers, hikers, cyclists, horse riders with our neighbours 100 yards away. It overlooks meadows and is surrounded by mature woodland. It has the added advantage of a lovely old 16th Century pub a five minute stroll away with a well equipped shop/post office/off licence nearby. The Cottage is suitable for families, couples, hikers and cyclists and is pet friendly. Families will love the nearby beaches and the many attractions including the Eden Project. For those wanting to walk or hike, the area has many footpaths. Cyclists are well catered for with a dedicated bike trail close by which runs from St. Austell to the closest beach at Pentewan and then onto Heligan and Mevagissey. This is also a walking trail. Those wanting to visit gardens will not be disappointed as there are a number in the area including the Lost Gardens of Heligan. The cottage is centrally heated and has a feeling of spaciousness. It offers three bedrooms and, very importantly, has 2 bathrooms, essential when the cottage is full. The master bedroom has a huge double super king bed and an en-suite. There is 1 bedroom with twin beds and a third with 2 full sized bunk beds. The main bathroom is superb with a free standing bath. Open the windows and you can watch the birds whilst lying in the bath with no neighbours to worry about. In the master bedroom, there are French doors opening to a sun terrace where you can sit and enjoy your first cup of tea/coffee of the day. Downstairs, the kitchen is a light and airy vaulted room which opens to a conservatory housing the breakfast area. The kitchen is hand crafted Shaker style with a slate floor and has been superbly equipped with a range cooker, SMEG fridge/freezer, SMEG dishwasher, washing machine etc. There is an ample supply of quality crockery, cutlery, glassware and kitchenware. It is very Cath Kidston. A few steps down from the kitchen is a spacious family room/dining room. This has an oak table with 6 oak chairs with matching sideboard. At the far end, near another French door opening to the side of the house, are two settees and a 42 inch television. This room is not only for dining but for relaxing either watching TV or having an aperitif before supper. As there are two sitting rooms, it is also useful for the kids to watch television in one sitting room whilst the adults relax in the other. There is an i-pod docking station for those who wish to listen to music. There is free Wi-Fi available. Adjoining this room, there is a beamed sitting room with an original inglenook fireplace with a log burner. It is furnished with 2 large leather settees and a leather chair (all reclining) seating 6. Here you will find another television and DVD player as well as games, books and DVDs. This is a cosy room especially on chilly autumn/winter evenings with the log burner alight. It is a good place to sit and sip a glass or two of red wine. Behind the cottage and rising up the valley side is a large and secluded garden set on three levels with steps and handrails and surrounded by trees, plants and flowers.. It has been thoughtfully landscaped with areas including level lawns and terracing retained with stone walls. There is a table and two benches on the top terrace which is a lovely place to sit and perhaps enjoy a gin and tonic or have a barbecue whilst enjoying the stunning views across the valley. Many of our visitors have started the day with breakfast on the terrace. It's a great way to spend the evening after a day on one of the many local beaches or after exploring one of the numerous local attractions. A barbecue is supplied. Why not try a break in the autumn and winter - the cottage is just as inviting with its oak beamed sitting room and log burner making it cosy and relaxing after a day enjoying one of the many attractions of the area. The area offers so much to see and do no matter what the weather that a short break (or longer) out of season is delightful. Why not think about a Christmas break or one before Christmas when there are various Christmas markets and ice skating at the Eden Project. After Christmas is a time for hibernation by the fire recovering from the excesses and maybe enjoying a few bracing walks. Our local team is on hand to assist you with any advice or problems that you encounter. We live in Hampshire and are both retired (Jim is a retired solicitor). We have two sons and 6 grandchildren. Two years ago we decided to buy a holiday home in Cornwall for our family and ourselves to enjoy as well as renting it out as a holiday home. We wanted to choose a property in this particular area of Cornwall where we have spent many happy holidays. 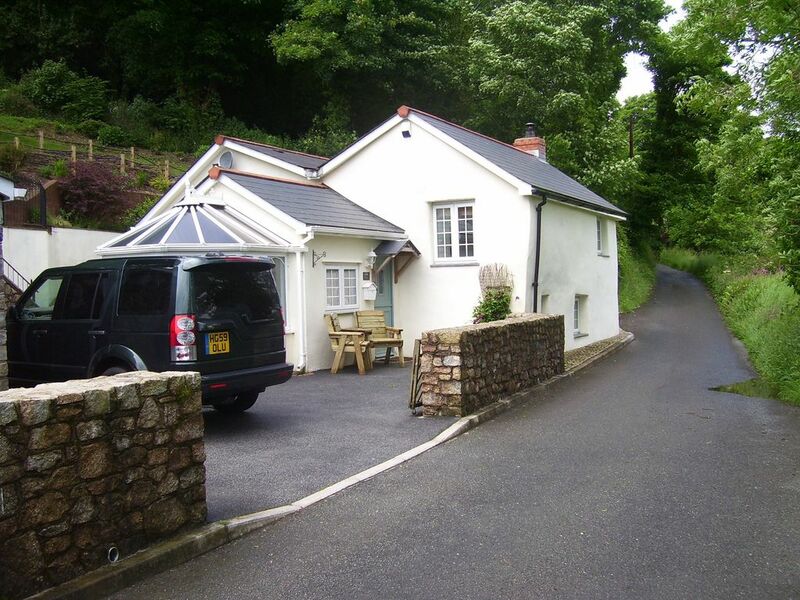 It is brilliantly located near so many attractions and lovely beaches and ideal for exploring any part of Cornwall. The moment we saw Honeysuckle Cottage we fell in love with it. It sits on a quiet lane which is full of wild flowers with a 16th Century pub just 5 minutes walk away. We loved the interior with its well fitted kitchen, beamed sitting room with log fire and a large family room. Upstairs the master bedroom with its own sun terrace outside is entrancing.. Outside the view across the valley is beautiful and our first experience of sitting there, whilst knocking back a few glasses of ice cold white wine, was to see a kestrel feeding its young which was spellbinding. It is a cottage for all seasons whether it be a warm summer day or a cool autumn or winter one when it is cosy and warm and where the area offers lots to do whatever the weather. Cornwall is renowned for its mild climate, diverse, dramatic scenery and beautiful beaches. Polgooth (meaning 'Goose Pond'), where the cottage is situated was a large tin mine supplying Phoenician traders with tin 3000 years ago. Most of the mining ceased in 1894 and there is little to show of its history although the old count house survives as does one of the old engine houses and a stamping mill - all now converted to private residences. Visitors will love the nearby beaches and the many attractions including the Eden Project and the Lost Gardens of Heligan. The area has many footpaths and cyclists are well catered for with a dedicated bike trail close by which runs from St Austell to the closest beach at Pentewan and then onto Heligan and Mevagissey. It is a wonderful place for Autumn or Winter breaks with lovely walks along beaches or perhaps in the nearby Kingswood with or without your dog. You can go ice skating at the Eden project from October to March (you don't have to pay the whole price of going into the Eden project). On 16 November, St Austell marks the beginning of winter with a Torch light parade being one of the many attractions. In the run up to Christmas, why not take the family to visit Santa at the Bodmin Railway 7-24 December. On returning from all that this part of Cornwall has to offer, light a log fire, toast some crumpets for tea (or maybe you have bought some scones and clotted cream - Cornish of course)and perhaps later pour a large glass of red wine.